Have you ever noticed that some people seem naturally able to give a great speech or presentation? It can sometimes seem as though these people, such as Steve Jobs or Martin Luther King, have an innate natural ability to orate and sell their ideas. Maybe you’ve experienced a great speaker in action for yourself during your own career, and been stirred into action? There are numerous reasons why you might want to improve your public speaking persuasion skills. 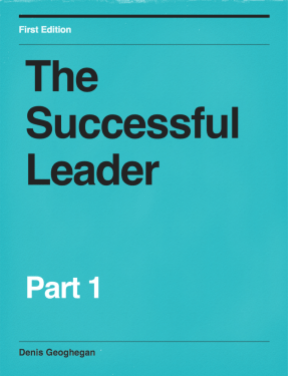 Perhaps you’re the leader of an organization and you need to rally your team around your strategic vision? Maybe you’re a middle manager trying motivate your team to achieve an objective? Perhaps you’re a team leader trying to convince your team to hit a deadline? If any of these scenarios are familiar to you, then having a process you can go through to construct a persuasive argument will be useful to you. When people first start learning about organizing a presentation or speech, they will often come across the “Tell Them What You Told Them” technique, first articulated by Aristotle. In this technique the idea is to, “tell them what you are going to tell them, tell them, and then tell them what you told them”. In your organization you’ve probably come across this presentation structure hundreds to times, where the presentation begins with what’s about to be covered, then moves on to the main body of the presentation, and then summarises the key points. It’s a good technique, being easy to remember and obviously widely used, but it’s not exactly useful for motivating people. This is where Monroe’s Motivated Sequence comes in. The audience: the audience are interested in their favourite topic, and it isn’t the contents of your presentation! They are only interested in themselves. By building your presentation using the Tell What You Told Them technique you’re constructing your presentation around your content, rather than your audience and what is of interest to them. Is it any wonder that they look glassy eyed? Suspense: it’s really difficult to keep people’s attention when your methodically ploughing through facts and figures. Why? Because there’s no suspense. There’s no promise of a revelation, so there’s no reason for them to keep listening. Is it any wonder that they’re secretly checking their email? 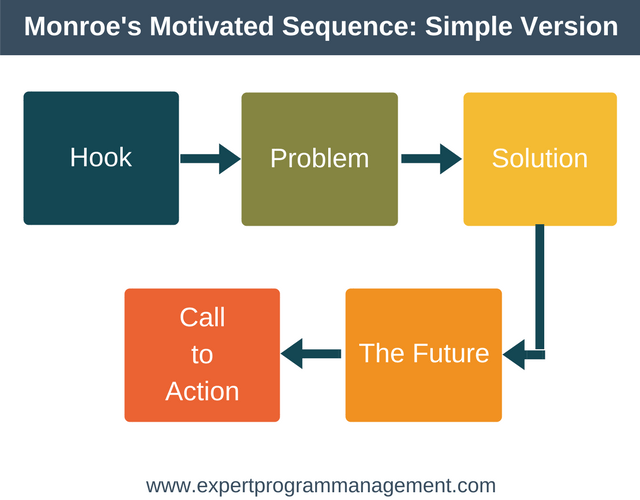 Monroe’s Motivated Sequence is a process for structuring a presentation or speech that addresses both of these issues. Alan H. Monroe was a professor of Communication at Purdue university, and underpinned by the power of human psychology, he created Monroe’s Motivated Sequence in the 1930’s to help people create a compelling and persuasive argument in 5 steps. The motivated sequence derives its name from the fact that it motivates and inspires your audience to care about what you are speaking about. Monroe’s Motivated Sequence is widely used to structure and organize presentations and speeches for maximum impact. It is summarized in the diagram below, and described below the diagram. Use your imagination here. You’re basically looking for a way to get your audience sit up and pay attention. Make your audience realize that you have something very interesting to say. In general people have very short attention spans, so once you have their attention you need to move on quickly. Note that this attention grabbing step doesn’t completely replace the introduction to your presentation, instead it is part of your introduction. You still need to establish your credibility as to why you’re speaking to them, state your purpose, and let your audience know what to expect. In this step you need to convince your audience that there is a problem. In step 1 you captured the audience’s attention. Now you need to maintain it, so state the problem clearly, and back this up by creating a sense of urgency. What you’re trying to do here is create a sense of dissonance, dissatisfaction, or discomfort. This will lead your audience members to seek a solution, or resolution. You can create this discomfort by clearly stating either the problem or the opportunity. Back up any statements you make by using statistics or other proof. Talk about the consequences of keeping things as they are and not changing. Show how the problem directly impacts your audience. Does it impact their health, their happiness, their job security? Appear to their instincts of either fear or greed. Essentially, in this step we’re painting a picture to really get the audience to understand and feel the need for the change. By the end of this step your audience should be primed and eager to hear your solution or recommendation. In this step you have created need. The audience understand the problem and its impact, and the NEED a solution. Now that you have created the desire and urgency in your audience to want to solve the problem, it’s time to delve into the heart of your presentation, and propose your solution. Introduce your solution or plan. Try to keep this complete but concise and avoid going into too much detail. You’ve worked hard to get people to this point and you don’t want to lose them now. If it’s going to take a significant amount of time to explain the plan, summarize your information from time to time at logical points as you work your way through it. Bring your solution to life using examples and stories. Pre-empt objections by laying out your counterarguments to likely objections. All you’re trying to do in this step is leave your audience with a clear understand of your plan. At the end of this step your audience will obviously understand your plan, and will be wondering what’s in it for them (remember: their favourite subject is themselves). In this step, now that the audience understands our solution, we need to intensify their desire for it by showing how it will make their lives better. This step is often called the projection step because it visualizes forward into the future. The are three techniques you can use for visualizing the future. Positive Method: Describe how the world will look if your plan is adopted. With this method you’re trying to inspire your audience to want this better version of the future. Negative Method: Describe how the world will look if your plan isn’t adopted. In this step we paint a negative picture, focussing on how the world will look if nothing changes. One straightforward way to use the negative method is to take the most undesirable fact from your need step (step 2) and extrapolate into the future, creating a bleak picture. Contrast Method: Begin by describing the negative picture, and then introduce the positive picture by describing and visualizing as eloquently as you can what what the world would look like if your plan was implemented. Although you want to be as vivid as possible, remember that your visualization of the future must also be realistic. If it isn’t, then you run the very real risk of losing your audience. At the end of this step your audience should be enjoying thinking about how the future will look if your plan is implemented. Now is the time to motivate them to take action, now! In this step you want to turn the desire you’ve created in your audience into action. Tell them exactly what you want them to do. In some cases you might simply be asking them to do nothing – essentially by not objecting they are implicitly agreeing with you plan and you will take the next steps to move it to implementation. Conclude by giving a final rousing appeal that encourages you audience to take action right now! In this example we’re going to consider a middle manager trying to give a rousing speech to get their team to deliver an important project on time. In the first step the speaker opens with the shocking fact that the project is likely to fail. In the second step the speaker makes it personal by elaborating how a late project will impact the lives of the team. In the third step of Monroe’s Motivated Sequence, the speaker shows a way for the team to avoid the negative consequences laid out in step two. In the fourth step, the speaker shows what’s in it for them by taking the course of action they are proposing. In this final step, the speaker tells the team what they need to do right now to start taking the course of action that is being proposed. This is obviously a somewhat contrived example, but hopefully it provokes some ideas as to how you could use Monroe’s Motivated Sequence to structure your own presentations and speeches. We’ve described Monroe’s Motivated Sequence as Monroe himself laid it out. Some people find it much easier use the terminology in the diagram below rather than the original as described by Monroe. Whether you’re a natural presenter or new to giving persuasive speeches, Monroe’s Motivated Sequence can help you structure your presentation so you increase the likelihood of stirring your audience into action. It can take time to master the sequence, but once you’ve tried it a couple of times your confidence will increase and so too will the power of your speeches. The 5 steps of Monroe’s Motivated Sequence are: grab the attention of your audience, establish the problem in their minds, present your solution, visualize a future with or without your solution, and finally provide a call to action to let your audience know what to do next. It’s a sequence that’s been used since the 1930’s and it’s sure to still be in use a long time from now.